The most common plating used on steel bending tools to extend tool life and prevent galling. Usually only mandrel balls and noses are hard-chrome plated. Occasionally the bore of a wiper or the cavity of a bend die is hard-chromed. However, the feathered edge of a plated wiper can become excessively brittle, therefore it will often fail before wearing out. 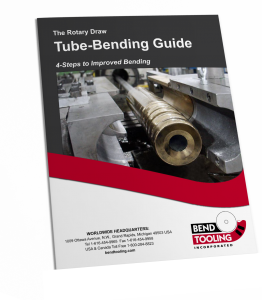 The plating of a bend die cavity does not pose any significant drawbacks, but it is seldom cost-effective to do so. Hard-chrome plating is recommended for steel tooling to bend non-ferrous materials, aluminum and copper in particular. It should not be used for black pipe, high-carbon steel, chrome-moly steel, stainless steel, titanium, and Inconel tubing; aluminum-bronze is recommended instead. Hard-chromed tools are effective for bending mild steel and aluminized tubing if the machine has a good lubrication system to flush away debris that might otherwise build up at incipient cracks in the plating.